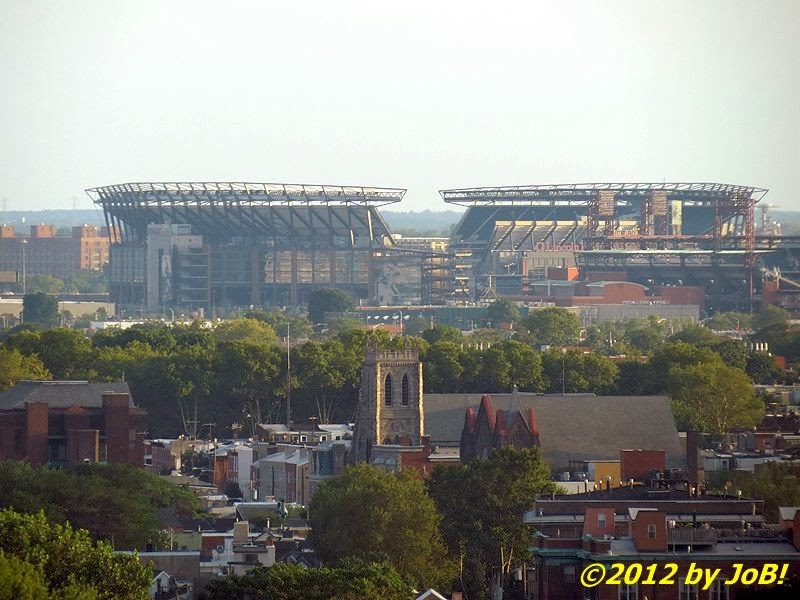 A telephoto view of Lincoln Financial Field, the home of the National Football League's Eagles, from our hotel room. I am a little partial to the city because I was born in one of its suburbs and spent the first few years of my life in very close proximity to--but not aware of--its history before moving away to start my more formative years. Although living just a two-hour drive away for almost 15 years, our family rarely made the effort to go back (my dad and I used to go to at least one Phillies' baseball game each year when I began to follow sports). I still root for them and their Eagles football team but I really don't have a true connection with the city and I wanted to make up for lost time on this trip. 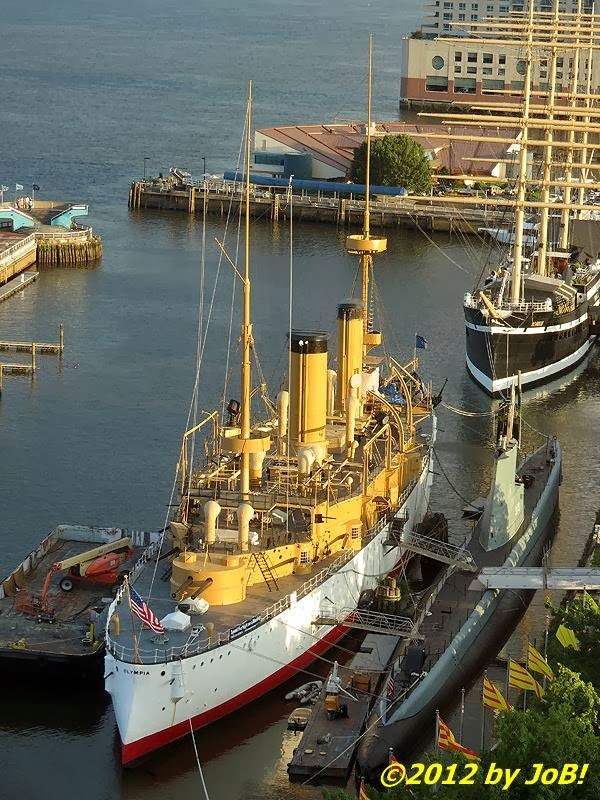 The steel warship USS Olympia, the World War II-era submarine USS Becuna, and the four-masted steel barque Moshulu berthed at Philadelphia's Independence Seaport Museum. Since this would only be only a 36-to-48 hour stay, I didn't want to lose a lot of time dealing with traffic to get from our hotel to the places that we wanted us to visit. 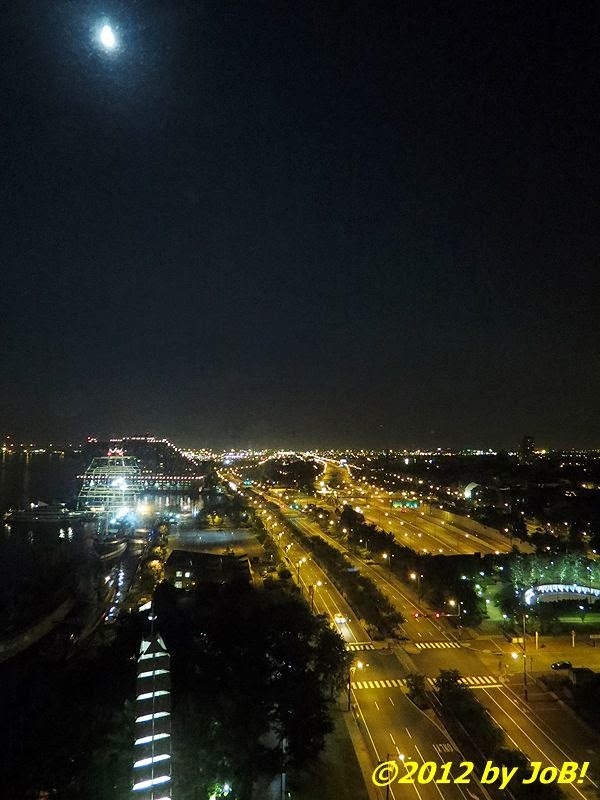 I splurged (just a tiny bit) and reserved us a room at the Hyatt Regency at Penn's Landing, situated on the western bank of the Delaware River and just a few short blocks from the main tourist areas. We had walked a lot during our two days in "the Big Apple" and this shorter distance was a welcome respite for my son (he was breaking in a new pair of sneakers and was suffering from blisters because he forgot to put in additional protective cushioning). Sticking close to our hotel after our two-hour drive, we had dinner and ventured along the riverside before turning in for the next day's activities. 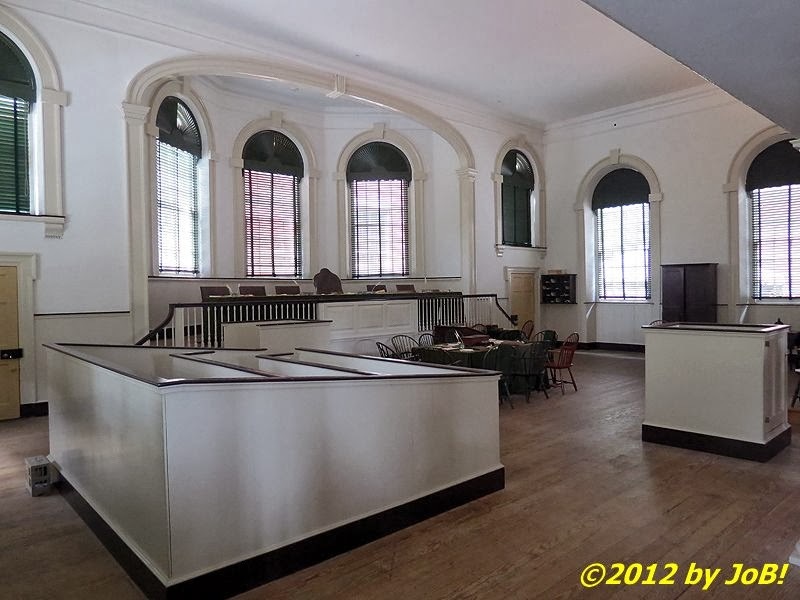 The restored courtroom inside the Old City Hall Building. It was forecast to be a hot and humid day with the threat of showers so shorts, comfortable shoes and an umbrella were assembled for wear (and for carrying). Once we walked over Interstate 95, our surroundings instantly took on an 18th century appearance. Along the way to the main areas of the Independence National Historical Park, we passed the First Bank of the United States, Carpenter's Hall, the Old Customs House and the Portrait Gallery in the Second Bank of the United States--all places that I would've liked to explore if we weren't so short on time. Once we got to the corner of Chestnut and South 5th Street, we could now see the places more familiar to the city's tourists--Independence Hall and the Liberty Bell Center. 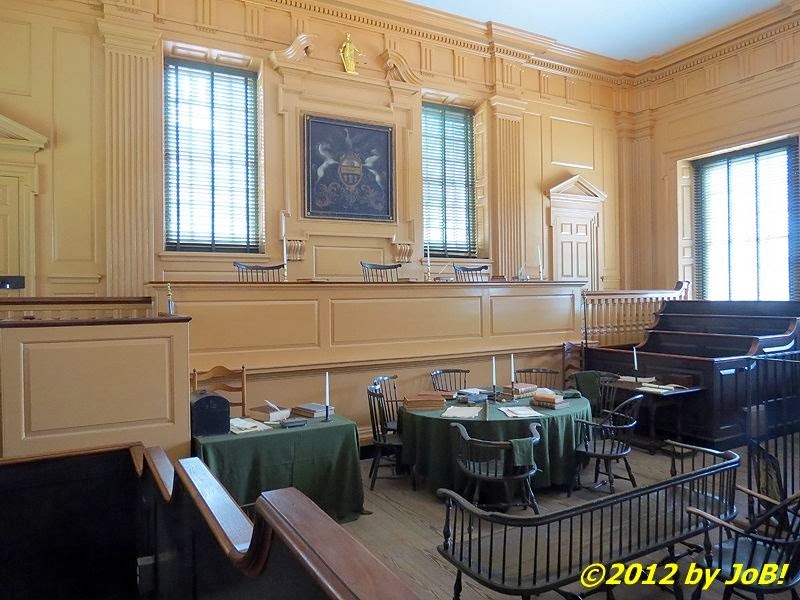 We did stop inside the Old City Hall Building, the one-time home of the US Supreme Court before we got our tickets for entrance into the Independence Hall complex of buildings at the visitor center. After the obligatory video introduction, we were led outside to await our appointed time to enter this hallowed facility. 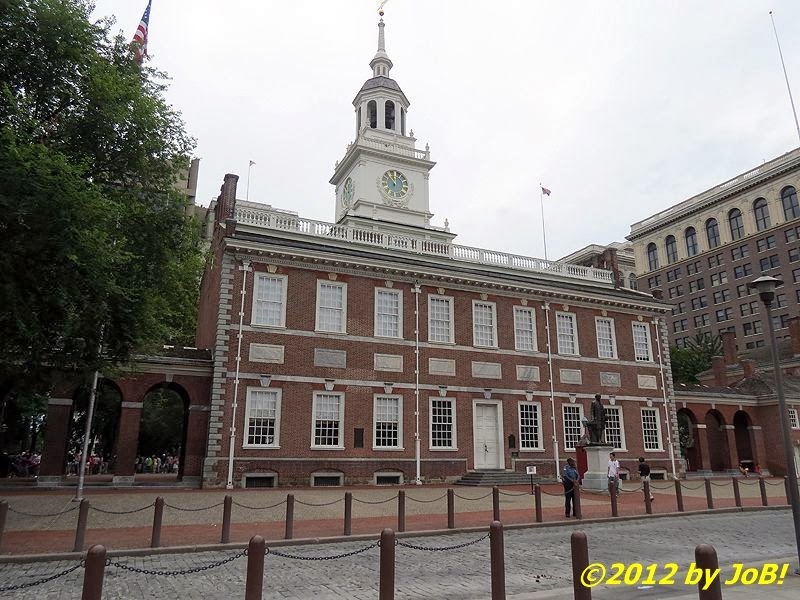 The north face of Independence Hall. 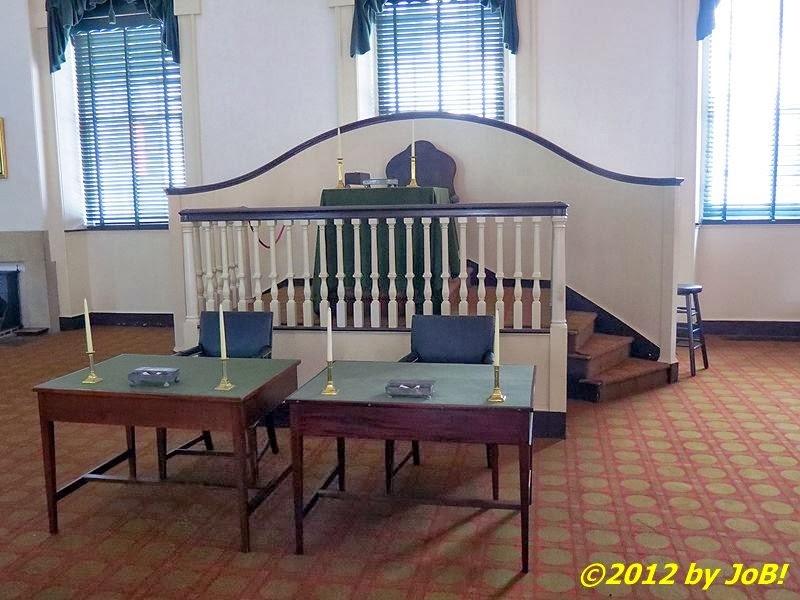 The Supreme Court Room inside Independence Hall. 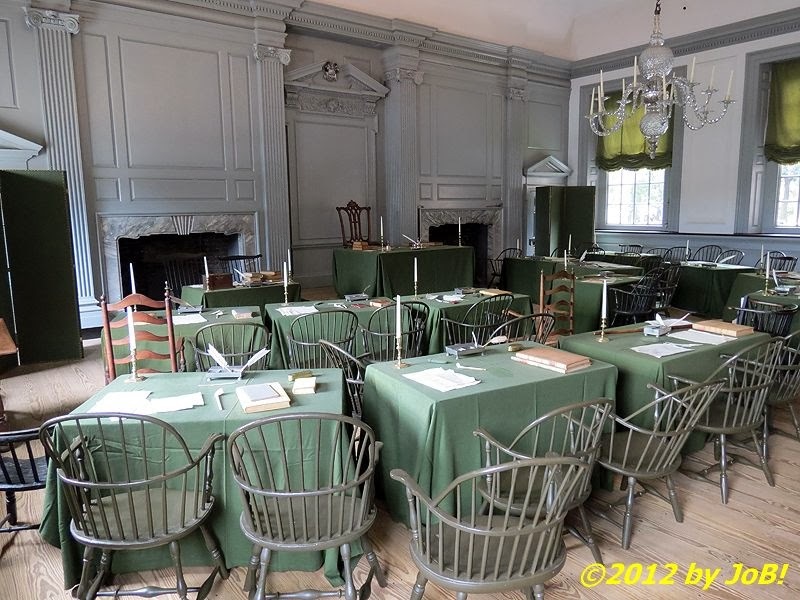 The Assembly Room inside Independence Hall. 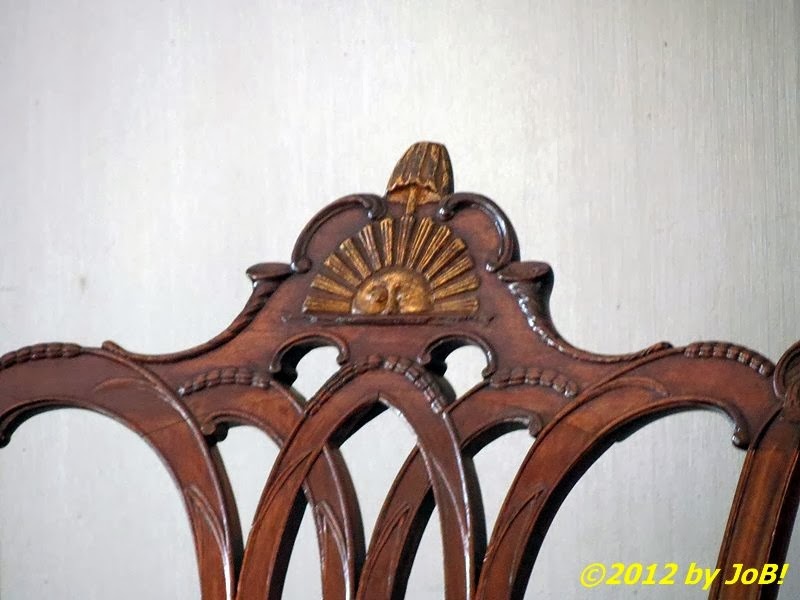 A close-up view of the "Rising Sun" armchair inside the Assembly Room at Independence Hall. With all of the history our nation has made over its nearly 238-year existence, I was now inside of the one facility where the Declaration of Independence, the Articles of Confederation and the US Constitution were all debated and adopted during the earliest days of our republic (George Washington was also named Commander-in-Chief of the Continental Army here in 1775). 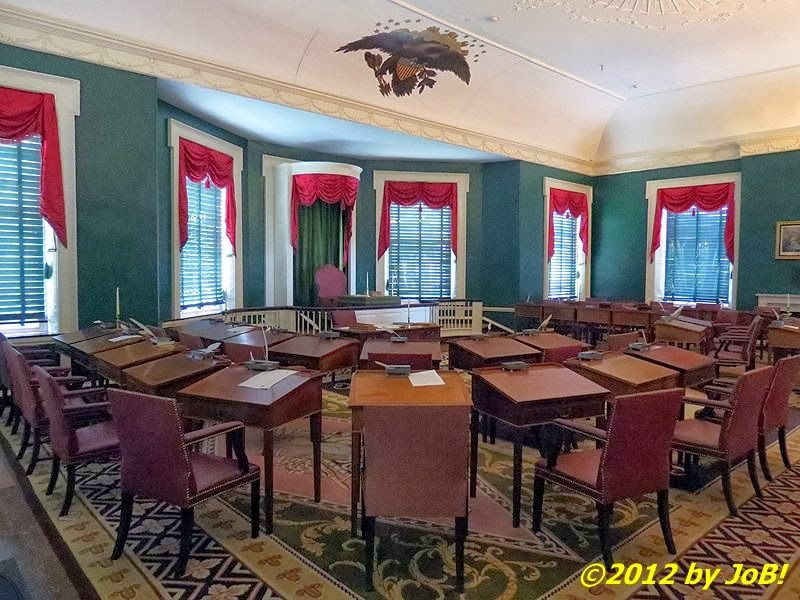 While having federal roles, it was primarily the home of the Pennsylvania legislature from 1735 until it was moved out in 1799 to its eventual final destination in the current capital of Harrisburg. The main features of the ground floor are the Supreme Court Room and the Assembly Room--the latter being the location of those previously mentioned events. When I was inside, my mind replayed the one scene in the movie 1776 when a clerk was operating a tote board positioned over one of the two fireplaces during the critical roll call of states for adoption of the Declaration. The chair at the main table has a depiction of the sun carved at its top that is often cited in the crafting of the US Constitution. Future president Washington sat in that chair during the three months of continuous sessions required to draft the document and Benjamin Franklin--as reported by James Madison--said "I have often looked at that behind the president without being able to tell whether it was rising or setting. But now I... know that it is a rising...sun" when giving his opinion about the nation's future after its adoption in 1787. The former House of Representatives chamber on the main floor of Congress Hall. The former Senate chamber on the second floor of Congress Hall. Not wanting to venture upstairs (and after many photographs), we made our way out to the southern courtyard area to see other the other buildings in the park complex. Congress Hall, just to the west of Independence Hall, served as the home of the US Congress from 1790 to 1800 and hosted presidential inaugurations (Washington's second and John Adams), the establishment of the First Bank of the United States, the Federal Mint, and the Department of the Navy, and the ratification of Jay's Treaty with England. The building's first floor hosted the House of Representatives while its second story was reserved for the Senate. One of the posters outside the Liberty Bell Center. 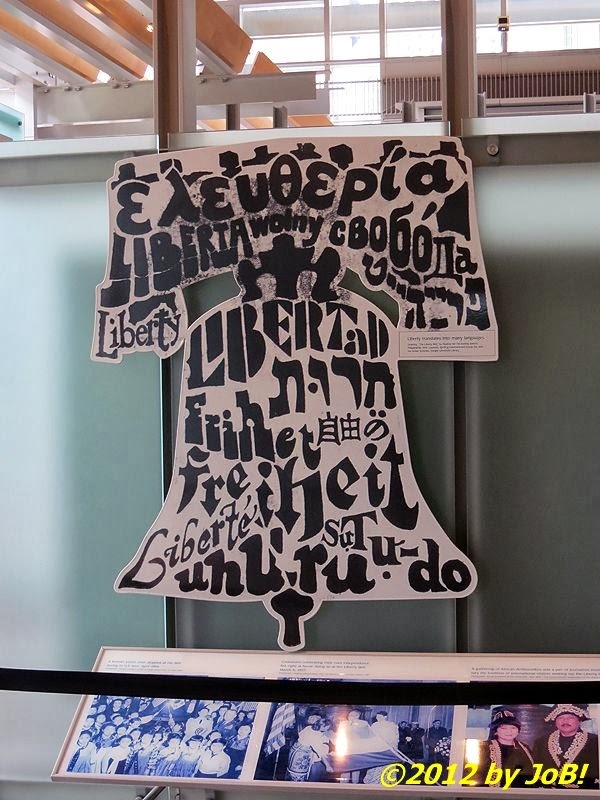 Artwork depicting the word "liberty" in different languages inside the Liberty Bell Center. 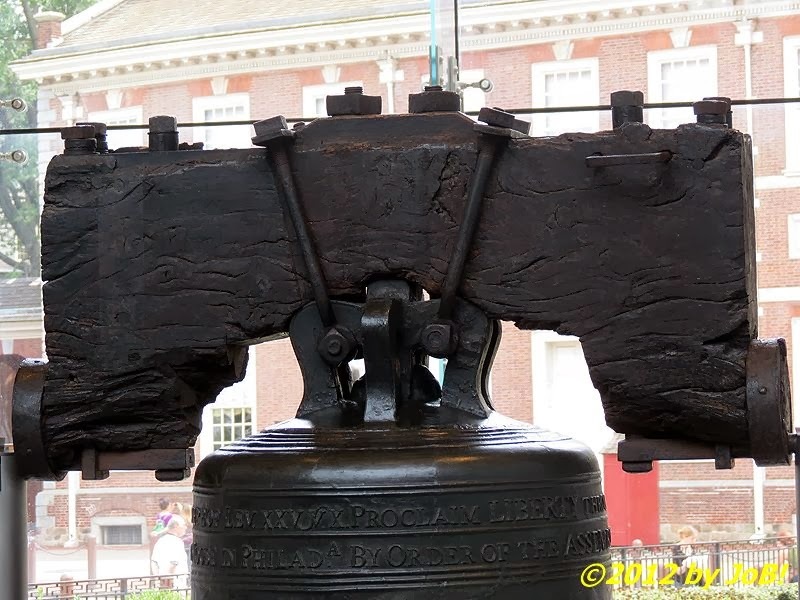 A close-up of the yoke and crown of the Liberty Bell. 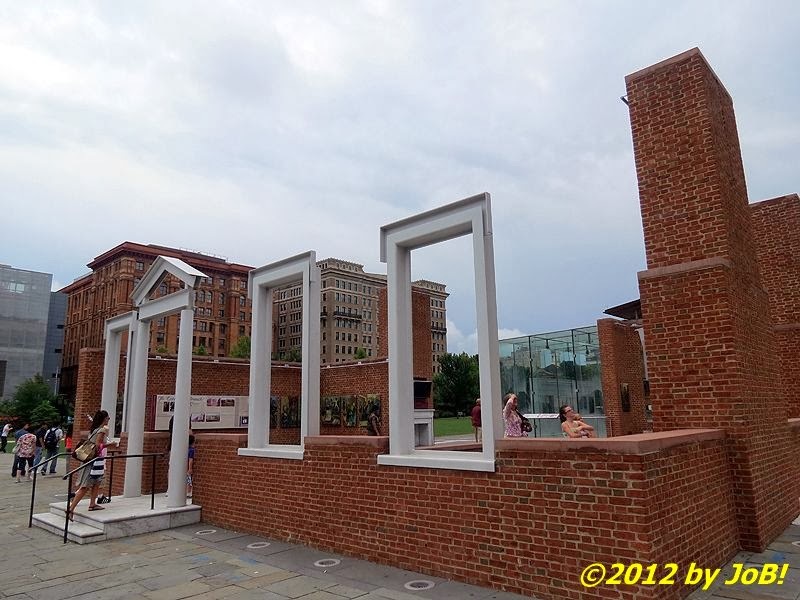 Because of the long line, our next attraction would have to be the Liberty Bell Center. Placed into a pavilion-like structure for the nation's bicentennial in 1976, a climate-controlled facility took over those duties in 2003 and it now hosts the artifact as well as numerous indoor and outdoor liberty themed displays. It took us about 40 minutes to go from the end of the line outside to standing in front of the bell and the weather, while humid and overcast, did cooperate and not subject us to any additional moisture. The President's House at Philadelphia's Independence National Historical Park. 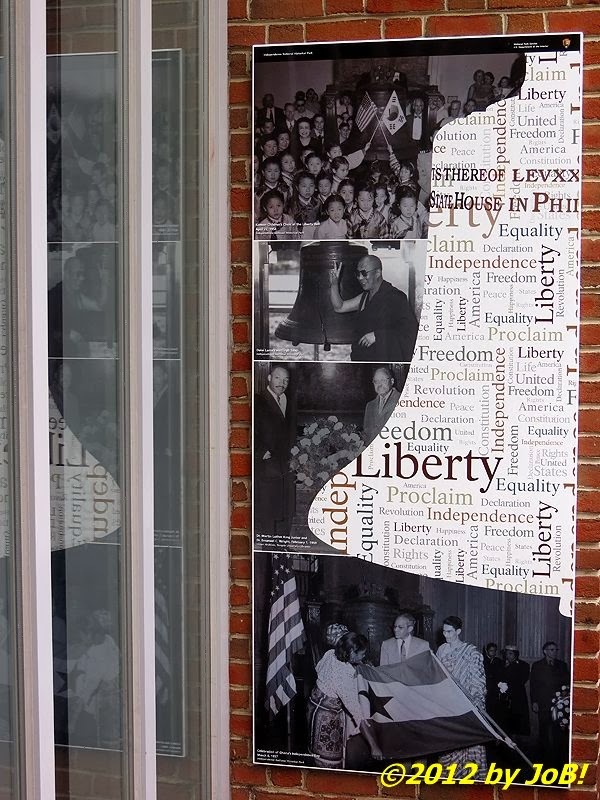 A portion of the signage addressing the history of the President's House. With so much emphasis upon the legislature and the judicial branch, there is very little in the way of executive branch on display at the park. One location, the President's House, is a memorial at the site of the nation's third executive mansion that was occupied by both Washington and Adams prior to the capital's move to Washington, DC in 1800. Although the original building was demolished in 1832, a minimalist foundation with some domicile-related attributes (doorway, windows, fireplace) were constructed in 2010 in an overall education effort as well as recognition of the slaves that Washington kept there and the topic of slavery in America's past in general. 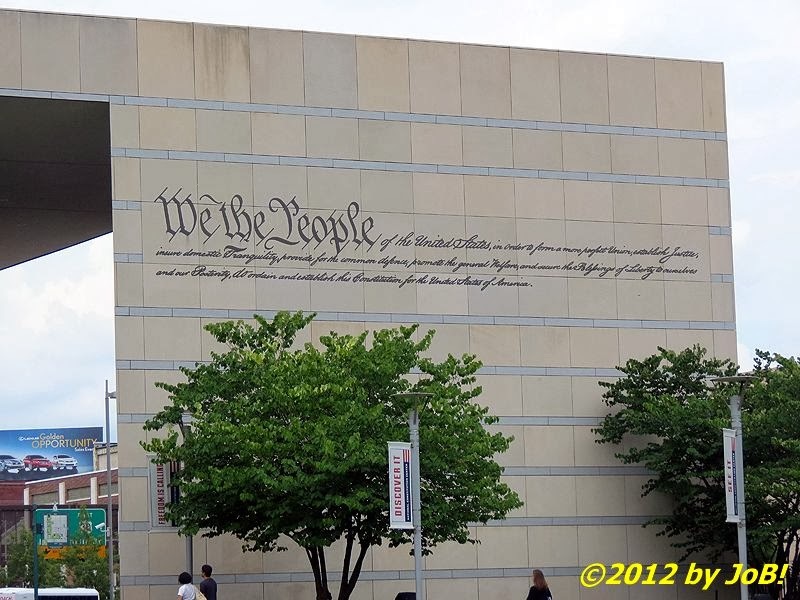 The preamble of the US Constitution appears on the outer face of Philadelphia's National Constitution Center. 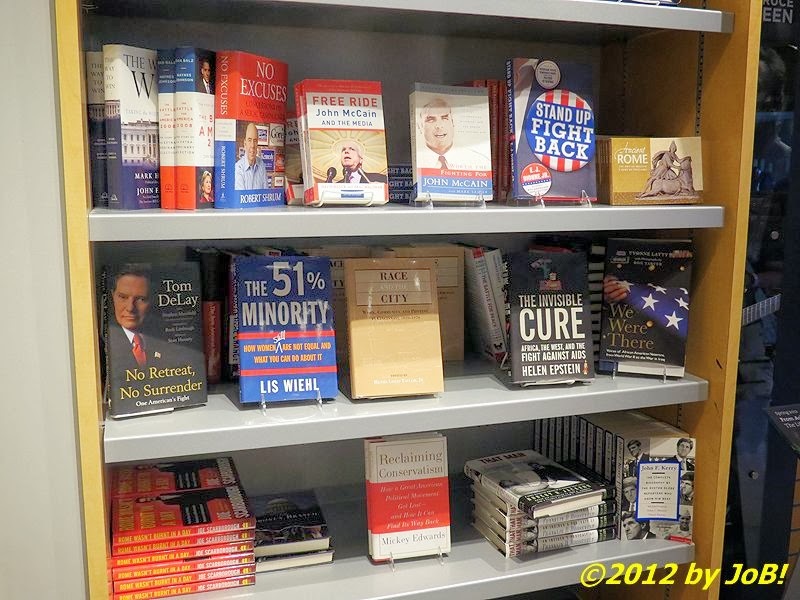 A sampling of the ideological literature for sale in the National Constitution Center's gift shop. Because of the large number of people visiting that location on that August day, our waits for the primary exhibits (and lunch) took up a good chunk of the overall time budgeted for the entire park. 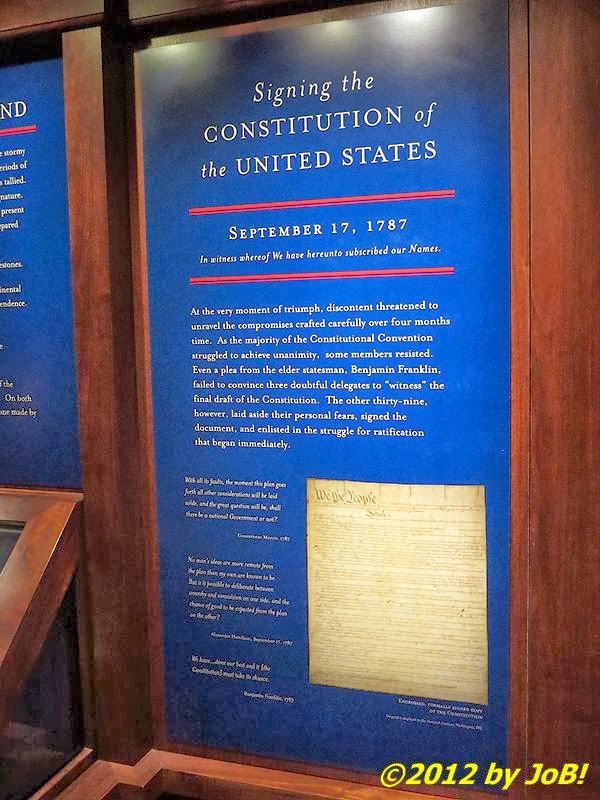 One of the places I wanted to see was the National Constitution Center, a non-profit, non-partisan institution focused specifically on that document and its legacy. When looking to enter around 3PM, we found out that it would be closing in less than two hours. I looked around the gift shop and did notice that their book selection appeared to be adhering to their advertised neutrality position. One of the few newspaper racks I could find out on the central Philadelphia streets. 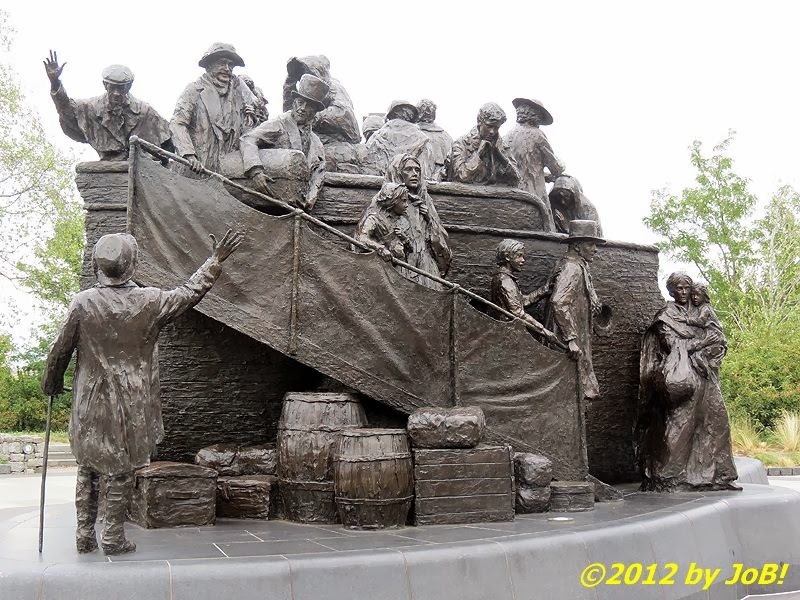 The Irish Memorial, commissioned to commemorate the150th anniversary of Ireland’s Great Hunger of the 1840s. 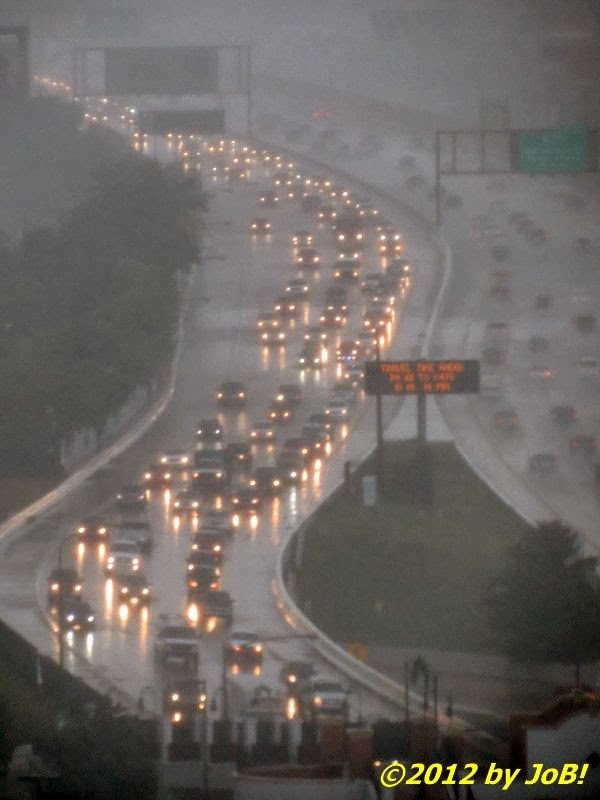 Rush hour traffic crawls through a summertime cloudburst thunderstorm. A full moon followed the stormy front for a pleasantly quiet night. Since it was getting late in the day, we headed back to the hotel. Along the way, I saw a rare cluster of newspaper racks out on the curb (it was for free papers, nothing requiring a monetary transaction) and a sculpture commemorating the 150th anniversary of Ireland's "Great Hunger", a famine that lingered from 1845 to 1852. Through deaths and emigration, the nation's population was reduced by an estimated two million people, a loss of 20 to 25 percent of its pre-blight totals. About 15 minutes after we returned to our room, the clouds opened up and about a half-inch of rain fell in a very short period of time, causing driving problems with the traffic passing on the nearby interstate and its tributaries. It ended just before nightfall and the full-moon illuminated night proved to be a quiet--and dry--one to help make the following day a little less complicated. 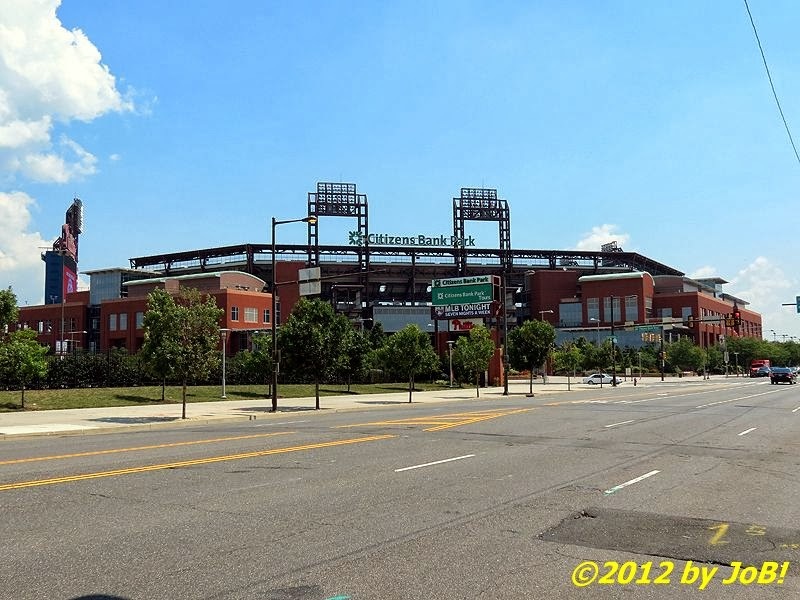 Citizens Bank Park, home of the Philadelphia Phillies baseball team. 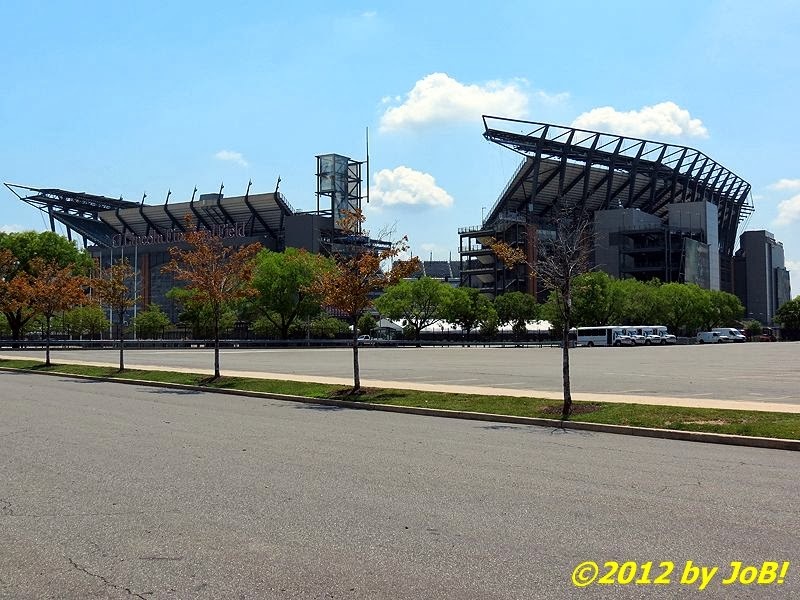 A closer view of Lincoln Financial Field. Facing another travel day, our departure was a little delayed because of checking out of the hotel and loading up the car. Only making just one wrong turn, we made it down to the South Philadelphia Sports Complex just before 11AM. The last time I attended a sporting event in this area was in the late 1980s when my wife, my dad and I saw the Phillies play the Houston Astros at the city's Veterans Stadium--"the Vet". Also the home for the football Eagles, that 32-year old multipurpose facility was replaced (and subsequently demolished) when two new sports-specific venues--Citizens Bank Park and Lincoln Financial Field--were opened about 10 years ago. My son is not a sports fan so I left him at the Xfinity Live! recreation facility while I wandered around the grounds. My "bucket list" has me attending at least one game in each stadium but neither team had anything happening in town at that moment. 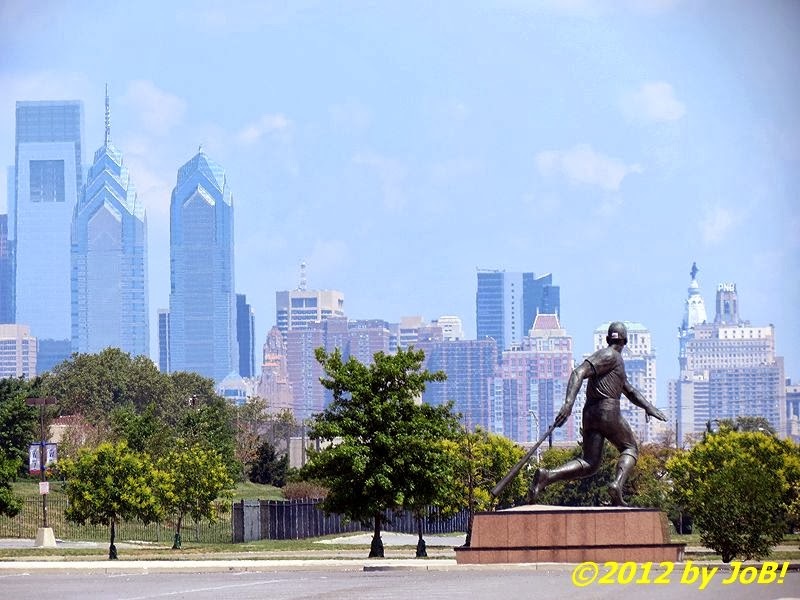 Joe Brown's "The Batter" faces the Philadelphia skyline. 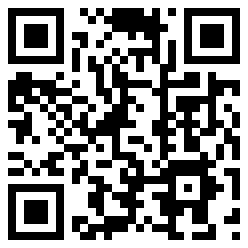 Barney Bright's "Dr. J." statue on the EP Henry Road to Victory outdoor display . When Veterans Stadium was still standing, there were several statues of generic football and baseball players erected around the grounds and these were relocated to other locations around the complex. 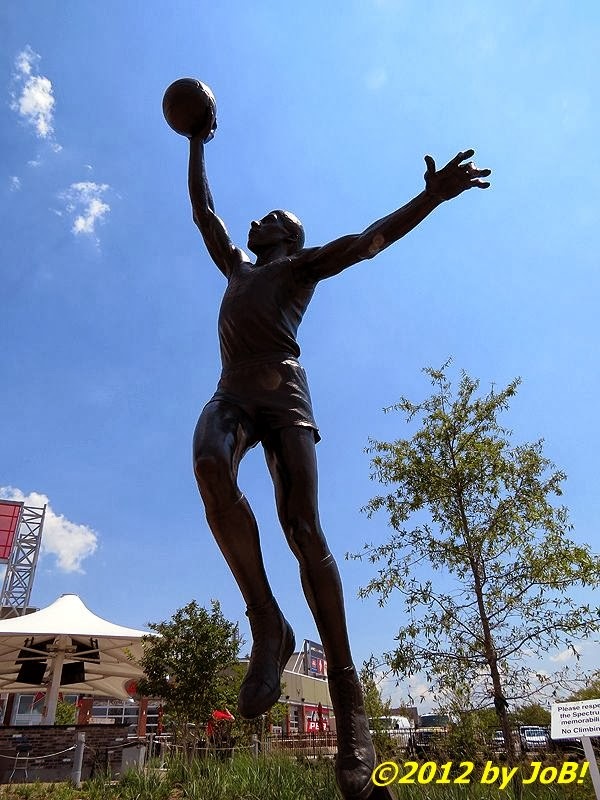 Another multi-use facility for indoor sports, the Spectrum, was replaced by the Wells Fargo Center in 1996 to be the new home for the city's basketball, hockey and indoor lacrosse teams (the 76ers, Flyers and Wings, respectively). That older venue was relegated to concerts, minor league hockey and indoor soccer use but was eventually torn down in early 2010 and the space converted into additional parking for the entire complex. Several Spectrum-era statues, to include one of my boyhood heroes, Julius "Dr. J." Erving, were moved to an outdoor display plaza adjacent to that recreation establishment a few months before our visit. After about an hour of wandering about and reminiscing about events from decades gone by, I retrieved my son and we started our trip down Interstate 95 towards the nation's capital--that is, the one to take over after this one. 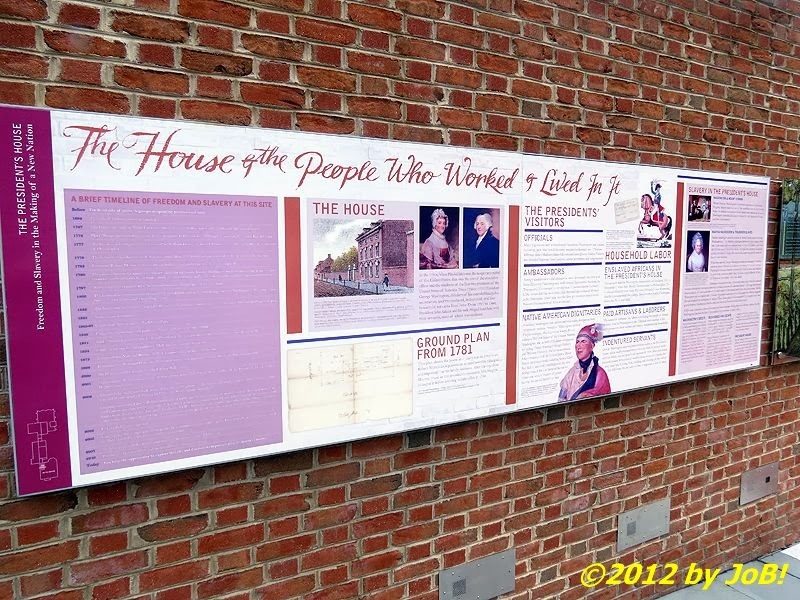 A display just outside Independence Hall documenting the signing of the US Constitution. This was probably the least "media friendly" stop on our vacation, but I'd like to identify some tenuous connections to the world of journalism. 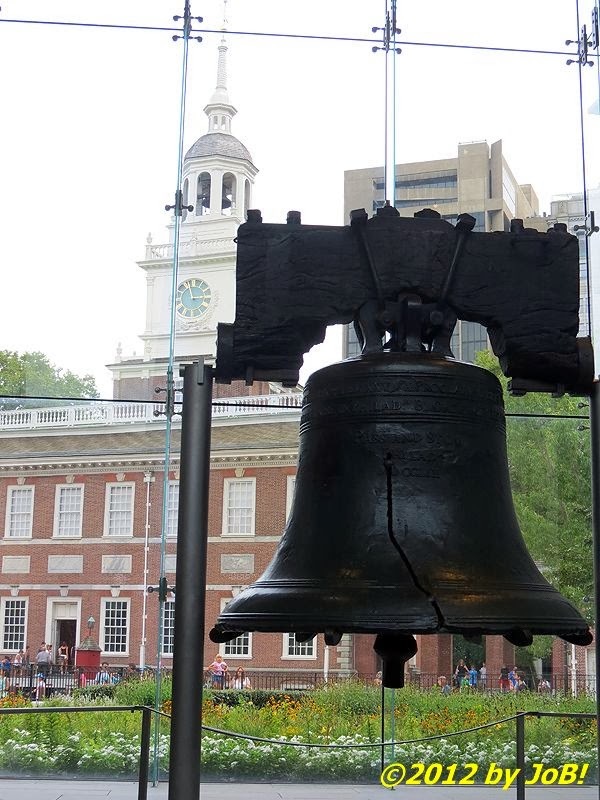 While the Bill of Rights is the source that many cite when discussing our nation's freedom of the press (and was proposed in New York City's Federal Hall), that specific set of changes were made to the US Constitution, our country's foundational document that was drafted and adopted in Philadelphia. Prior to the adoption of the First Amendment, colonial journalism was hamstrung by tight government censorship of information it felt to imperil its control over the population. It wasn't until 1735 and the unsuccessful sedition case involving The New York Weekly Journal's publisher, John Peter Zenger, that a new-found sense of press freedom was achieved that would eventually be codified into law in 1791. As much as I rolled my eyes seeing the ideological publications of Joe Scarborough, Tom Delay and Newt Gingrich on the bookshelves at the National Constitution Center's gift shop, I completely understand that the parallel privilege to press freedom, our freedom of speech, is a necessary element with a democratic society. Sadly, the 1798 Alien and Sedition Acts, the first of several threats by lawmakers and lawyers to this ideal of a independent press, were enacted by the 5th United States Congress right next to the building where those freedoms were envisioned. 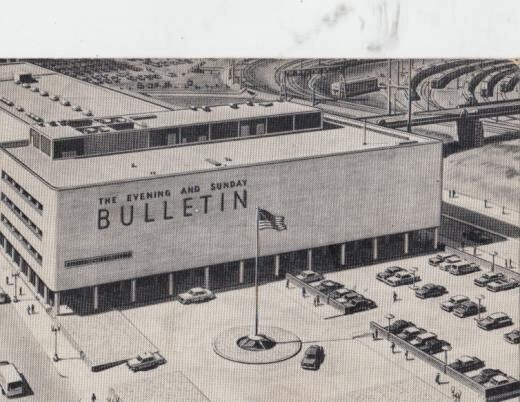 Postcard picture of The Evening and Sunday Bulletin Building (circa 1955). 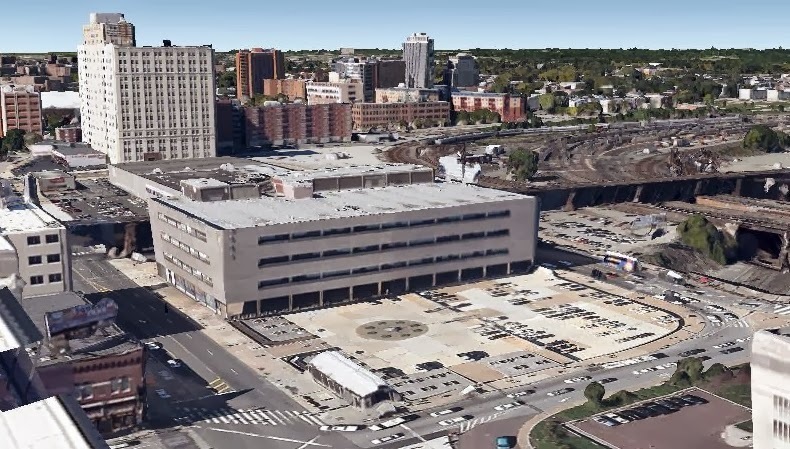 Google Earth's more recent depiction of One Drexel Plaza looking northwest (circa 2011). 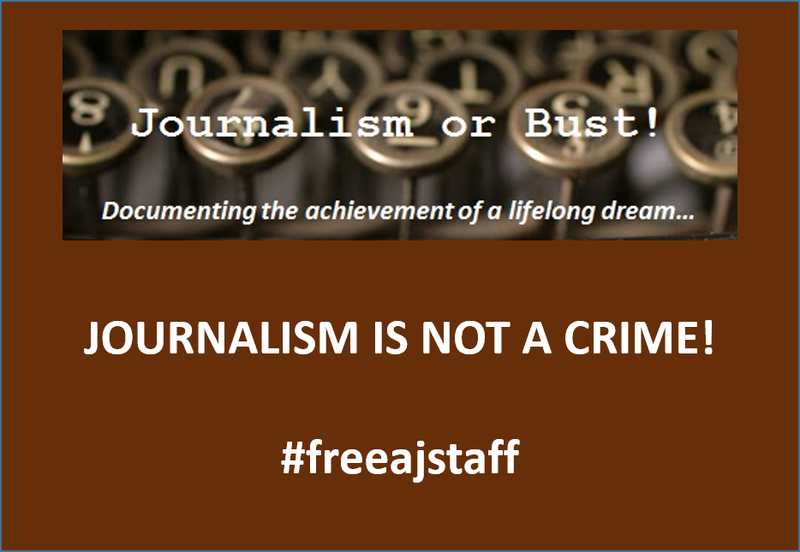 I've mentioned in my profile and in other postings here that I'm the son of a newspaper printer--one of the reasons that I have chosen to act upon this lifelong desire to break into journalism. For several years during my early life, my father worked as a Linotype operator for The Philadelphia Evening Bulletin, the city's evening edition for 134 years. Like many afternoon papers, it began to endure the hard economic realities associated with late-day deliveries as well as competition from the nightly network television newscasts. It also faced stiff commercial and journalistic competition from its morning rival, The Philadelphia Inquirer, and the last edition of The Bulletin came out in late January 1982. At one time, it had been the best selling newspaper in the city for 76 years and was the largest evening publication in North America in the 1950s and 1960s. We moved well before its demise but it's still sad to think that parts of your past no longer exist in today's world--much like my dad's own passing over 20 years ago. I found an online image of the building where he used to work, situated at 31st and Market Streets, and I was surprised to learn that it is still standing. Drexel University purchased it from in 1993 and converted it into One Drexel Plaza, the current home of the school's Evening and Professional Studies Programs. 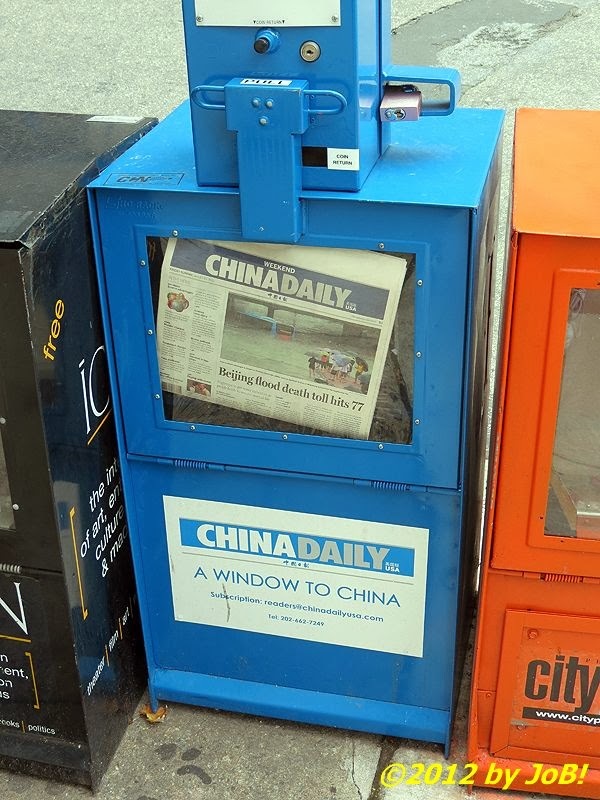 At one time in the city's history, over a dozen dailies competed for readership in "The City of Brotherly Love"; today, that total stands at just two (the Inquirer and The Philadelphia Daily News--it serves as an edition of the other paper) with a total circulation of just over 300,000 readers (that is less than half of what The Evening Bulletin was pulling in during its heyday). 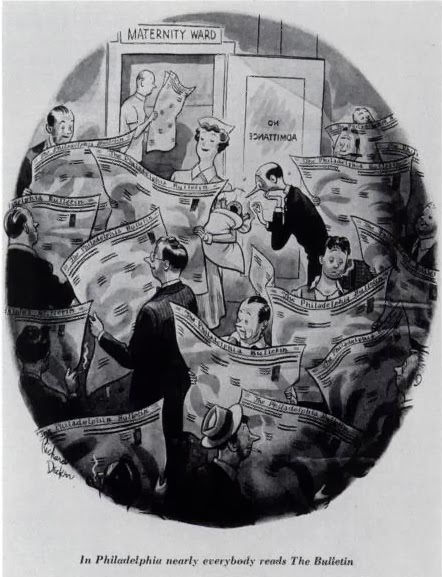 I found a cartoon advertisement for that paper that was used in the 1950s and I have included it above. In a maternity ward's waiting room, all but one within a gaggle of expecting fathers are so engrossed in their newspapers that they don't notice a paper-reading nurse bring in a crying baby (and the doctor appears to be joining in as well in the background). The tag line at the bottom says "In Philadelphia, nearly everybody reads The Bulletin" to tout their circulation numbers and market share. After they shut down, it was slightly changed to read "In Philadelphia, nearly everybody read The Bulletin" to amplify the past tense. With cable news and the internet causing similar newspaper demises around the globe in the 32 years since they went out of business, I feel honored to have a personal connection with such a venerable journalistic institution within a city with so much historical significance. Expecting this to be my sole connection with my father's past, you could just imagine my surprise when I would later come face-to-face with the tools of his trade (and that will be the subject of my final vacation installment).